Let’s say that you have a special offer you want to serve to specific users who came to your website via a certain campaign. 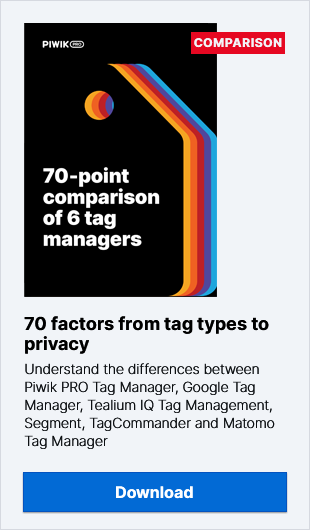 With Piwik PRO Tag Manager you can configure this custom content to be displayed without editing the source code of the website at all. Now, thanks to this configuration our specific popup will be shown to a user upon any subsequent pageview. Until he or she closes the popup, of course. Choose Cookie from among the available templates. Insert a Cookie name – this must be the same as the cookie name configured within the cookie-tracking script which is available here. Save the new variable and go to the Tag list page. Ok, we have just configured our variable, after having set up the tracking cookie earlier, and now we have to connect all the bits into one tag with a specific trigger. Set the Tag name and choose Asynchronous custom HTML tag. Last but not least, is the Trigger configuration. It is here that we will use our cookie-based variable which we have configured in the previous section. Save the new Trigger as well as the whole tag. Now we can Publish our new changes. Now comes the big moment – testing out the new configuration. First, check to see if any popup is displayed after visiting a website via a URL without any parameters, tracking or otherwise. Nothing – which is ok! Note: this special promo code is created only to present this use case. To try out Piwik PRO Cloud and get a special offer please contact the Piwik PRO team.